If you’re planning on taking a train to Philadelphia to see Pope Francis in September, the special tickets you need will go on sale Monday, July 20, at 9 a.m.
SEPTA described in a statement July 13 the purchase process for the tickets, called Papal Passes, on the Regional Rail lines and details on which stations would be in operation for the papal events Sept. 26 and 27 — see details of the papal itinerary in Philadelphia. All passengers for either or both days will need to buy a $10 one-day pass for each day of travel. Existing tickets or Trail Passes will not be accepted for papal event travel, only the special passes. Up to 10 passes can be purchased in one transaction through the e-commerce site expected to launch the morning of July 20 at septa.org. Postage charges for shipping the tickets will apply. When customers purchase a pass, they must select the station from which they will be departing for center city and the time slot. The name of the station will be printed on the back of the pass. It will be valid only for travel from that specific station during the selected time, and for travel from center city back to that station after the day’s events. All riders using Regional Rail on Sept. 26 and 27 will be required to pre-purchase these passes. Trains will begin running as express trains — making only one or two stops along the entire line — from the 18 outlying stations to center city from 5:30 a.m. to noon both days. SEPTA said in order to “help alleviate congestion and enhance safety,” SEPTA will have two travel slots, the first from 5:30 a.m.-8:30 a.m., the second 8:30 a.m.-noon at each station except Cornwells Heights and Croydon in Bucks County. Cornwells Heights will be open during the early slot from 5:30 a.m.-8:30 a.m., and Croydon from 8:30 a.m.-noon. SEPTA also announced the list of outlying stations and their designated drop-off stations in center city. Two changes from the initial June announcement on train travel for the papal events include the Doylestown line, where the Pennbrook Station replaces the Lansdale station, and the Trenton line, which has added the Levittown station. All trains will end in only three center city stations: Jefferson Station (the former Market East station), 30th Street Station and University City Station. Passengers will have to walk to papal event sites including the Cathedral of SS. Peter and Paul (18th and Benjamin Franklin Parkway) and Independence Hall, and especially the Ben Franklin Parkway which will host the Festival of Families on Saturday night and the papal Mass on Sunday afternoon. People traveling to the events by bus, trolley or the Market-Frankford Elevated or Broad Street Subway lines will not need special passes and can use existing tokens and passes. 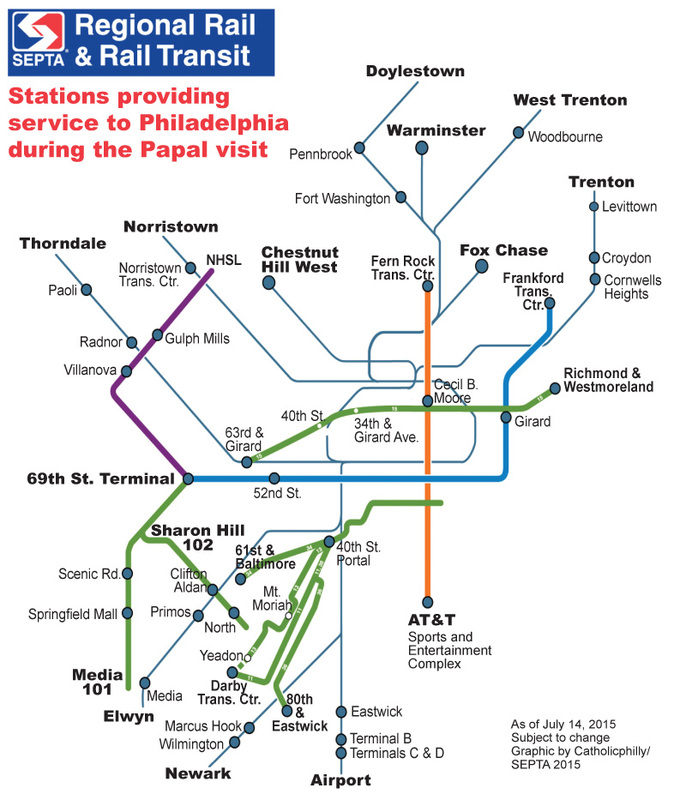 But special three-day Papal Visit transit passes will be available starting Monday, July 27 at the septa.org site. The passes will allow travel from Saturday, Sept. 26 to Monday, Sept. 28. SEPTA’s website didn’t work properly this morning. In the first 10 minutes, SEPTA had 900,000 people trying to buy tickets and they are only selling 175,000 for each day!!! I’ve read a number of articles that said they doubt SEPTA will be able to handle this event. They should be working with Amtrak, NJ Transit, and other regional train providers to increase capacity. But alas, they are not. If people don’t get to see the Pope and the turn out is small and makes Philly look bad, it will be SEPTA’s fault. I would hate to see all the great, hard work put on by the dedicated staff at the World Meeting go down the drain due to SEPTA’s incompetence. If you take a regional Rail train from Media or Primos stations, why are they only stopping at Unversity City station, during the Pope’s visit? Especially since The Airport Line at Terminals A, B, C/D, 8000 Essington Ave., Philadelphia, PA 19153 stops at Jefferson Station. The Media/Elwyn line and Wilmington/Newark line should stop at Jefferson Station also.We need a massive boycott of tickets for Regional Rail Travel to the Pope’s visit, since SEPTA cannot even balance their operating budgets every four years. We should innundate SEPTA with phone calls demanding that trains stop at Jefferson Station, instead of dumping people blocks away from their destination. What happens to people on shift work (like hospital, nursing home workers) who will not get their schedule until maybe a week before the event? (So the “servants to the sick and elderly “are excluded, cut out!”) How about people who are simply not sure of the times when they can go because relative are coming from out of town at different times? What about someone who simply wants to get up that day and go by train? What about people who cannot buy tickets on the web because they do not have a credit or debit card? I thought this event was all about the bringing people together. The poor and the marginalized do not often have access to buying on the web, and their lives are often less organized than the better off. There seems to be little room for hospitality and spontaneity. Nothing of the “Joy of the Gospel!” The even seems like it is being prepared for “lock-step Catholics or grade schoolers,”get your permission slip, bring in your money, get in your place, stay in line and keep your mouth shut.